Can you guess the most frequently occurring form of ALL cancers? 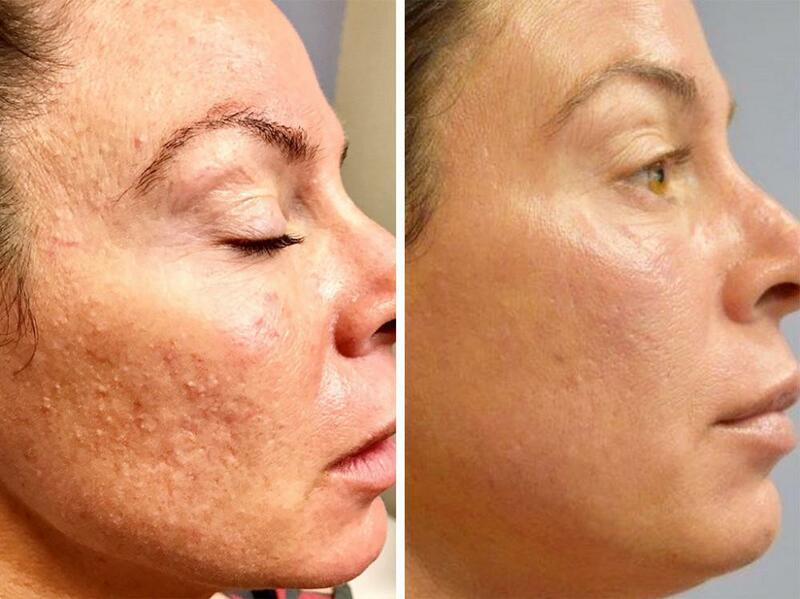 If you guessed basal cell carcinoma (BCC), then you’re correct! Each year in the United States more than 4 million cases of basal cell carcinoma are diagnosed. Even more startling is the fact that 1/3 of every new cancer is skin cancer, most of which is basal cell carcinoma. Additionally, between 40-50% of Americans who live to age 65 will have BCC at least once. Abnormal, uncontrolled growths or lesions that arise in the skin’s basal cells. 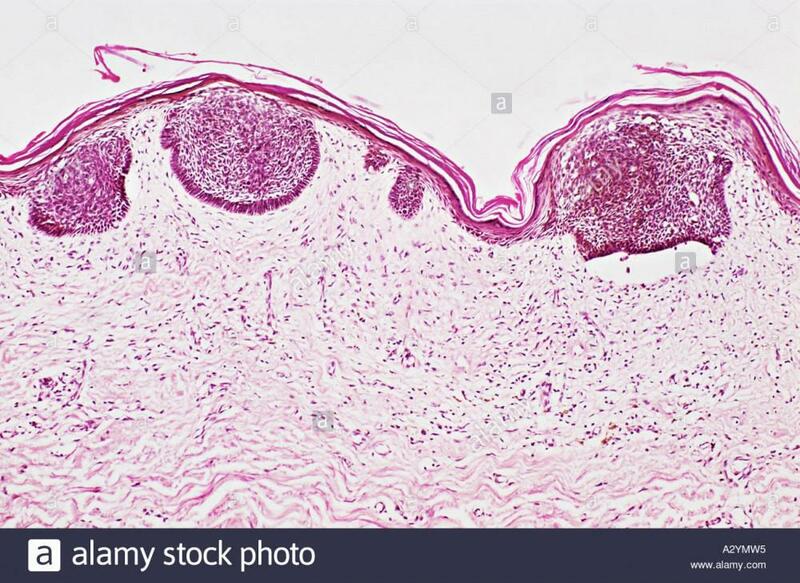 These are the cells that line the deepest layer of the outermost layer of skin- the epidermis. Look like open sores, red patches, pink growths, shiny bumps, or even scars. Caused by cumulative sun exposure. Typically does not spread beyond the original tumor site, however there are exceptions. These cancers can cause severe disfigurement if left untreated. It is the most frequently occurring form of ALL cancers. 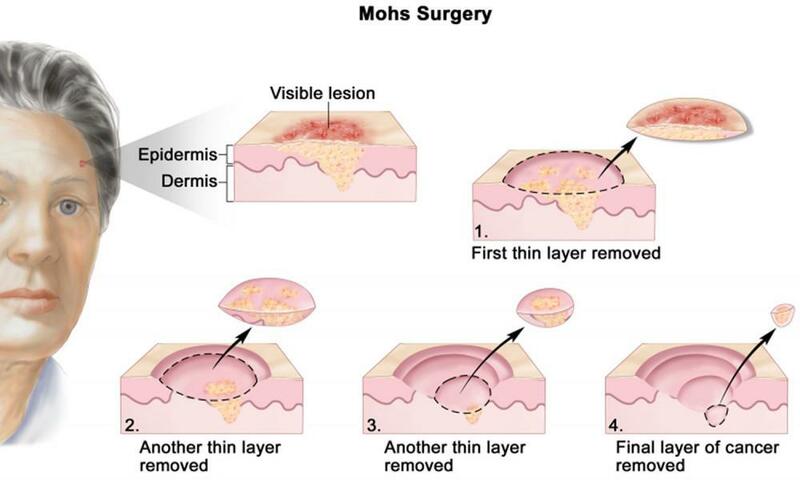 Most effective form of treatment is Mohs Micrographic Surgery. This is because it is the procedure that best removes all cancerous tissue at the tumor site. David Roy is the only Mohs surgeon in the Hattiesburg area, and is only 1 of 9 Mohs surgeons in the entire state of Mississippi. BCC develops most often on the areas of skin that get frequent sun exposure such as the neck, head, face, or the back of hands and forearms. The most common of these sites however is on the nose. However, like every other cancer, BCC does not have any boundaries as to where it can form as it can appear on the trunk, legs, feet, and upper arms. This particular cancer grows much slower than the other skin cancer types. 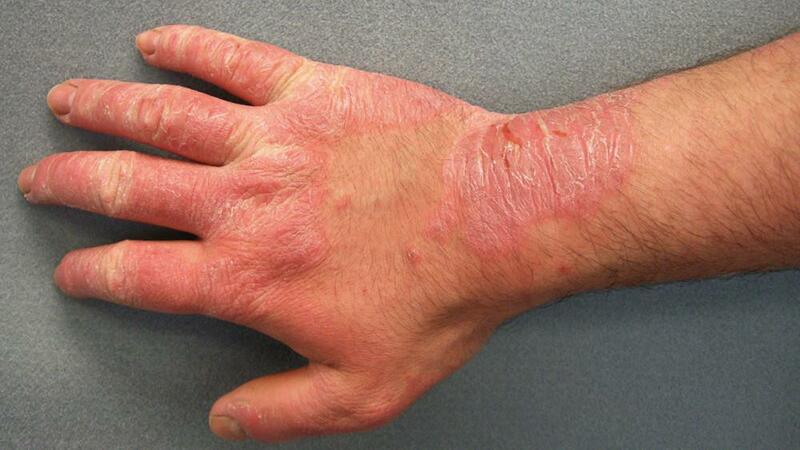 As mentioned above, the cancer can cause severe disfigurement when left untreated. This cancer can grow both extremely wide and deep, causing it to destroy skin, deeper tissue, and can even bone. This can make it difficult to see the edges of the tumor. Dome-shaped growth. Often times the blood vessels can be visible. Often appears pink or skin colored, however, it could also appear brown or black. May flatten in the center like a crater or ooze. Shiny pink/red, slightly scaly patch (this is particularly true when it shows up on the trunk). 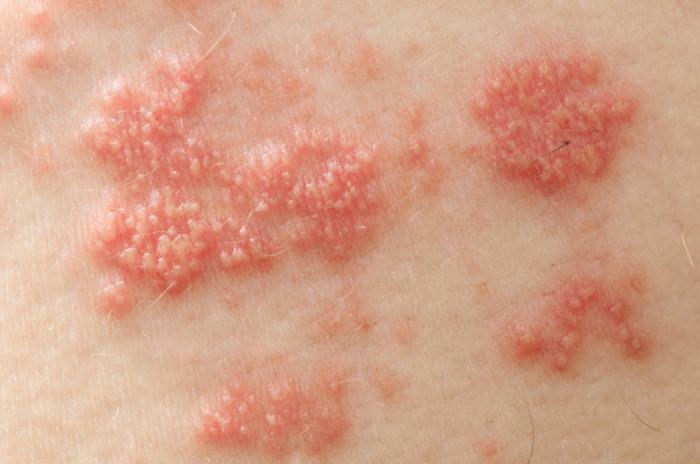 Sometimes basal cell carcinoma can be mistaken for a patch of eczema. Can appear as a lesion or sore that bleeds easily, fails to heal/returns, oozes & crusts over, has a sunken crater, or has blood vessels in or around it that are visible. In rare cases it can feel painful or itch. 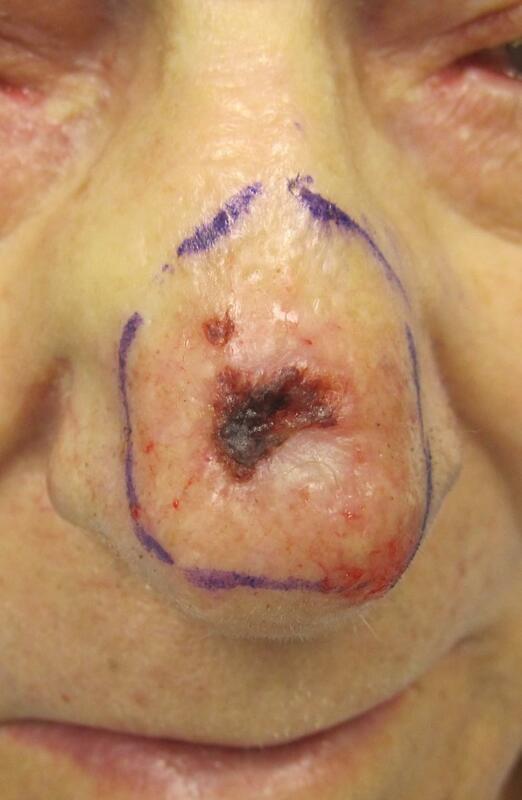 The best way to diagnose BCC is to have a biopsy done on a suspicious lesion. Come see a PBD provider to have this done. Once the results come back, we will determine what treatment option is best for you. There are many different ways to treat BCC, with Mohs being the most effective. Excision: the procedure is rather self-explanatory. The site is slightly numbed and then any remaining tumor will be cut out, as well as any surrounding skin that may have an increased risk of developing the cancer as well. Curettage & Electrodessication: this is a two-step procedure for dealing with BCC. First, the tumor is scraped away by one of our providers. Once that is done than electricity is used to destroy any remaining cancer cells. Cryosurgery: this treatment will remove the BCC tumor by freezing it off with liquid nitrogen. 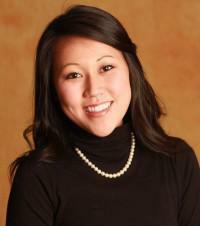 Mohs Micrographic Surgery: this is a specialized surgery used to remove many types of skin cancer. This procedure offers the highest cure rate for difficult to treat basal cell cancers. Your PBD provider will determine if Mohs is the right procedure for you. If it is, you’ll be in great hands with Dr. Roy! The tumor, along with a very small amount of skin surrounding the skin that appears to be normal, is cut out (almost shaved out). Once that is done, the tissue is examined under a microscope. This process is continued until the surgeon no longer sees any cancerous tissue left in the cut. Continue scheduling follow ups with your PBD provider. While a cancer diagnosis can be scary, there is a silver lining that comes with it. When detected early, most skin cancers can be cured, even the more dealy ones such as melanoma and MCC. Always perform self-exams, or have a loved one routinely perform quick screenings for you. How often you should perform them often depends on the skin cancer you have a history of. Anything that looks out of the ordinary, come see us! Better to be safe than sorry. Wear sunscreen that has SPF 30 or higher when out in the sun.